The aim of this study was to report on 8 patients with all different non-ischemic etiologies for portal-venous gas and to discuss this rare entity and its potentially misleading CT findings in context with a review of the literature. The CT examinations of eight patients who presented with intrahepatic portal-venous gas, unrelated to bowel ischemia or infarction, were reviewed and compared with their medical records with special emphasis on the pathogenesis and clinical impact of portal-venous gas caused by non-ischemic conditions. The etiologies for portal-venous gas included: abdominal trauma (n=1); large gastric cancer (n=1); prior gastroscopic biopsy (n=1); prior hemicolectomy (n=1); graft-vs-host reaction (n=1); large paracolic abscess (n=1); mesenteric recurrence of ovarian cancer superinfected with clostridium septicum (n=1); and sepsis with Pseudomonas aeruginosa (n=1). The clinical outcome of all patients was determined by their underlying disease and not negatively influenced by the presence of portal-venous gas. 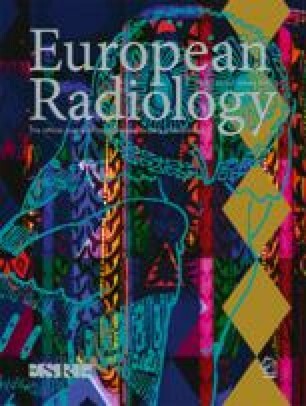 Although the presence of portal-venous gas usually raises the suspicion of bowel ischemia and/or intestinal necrosis, this CT finding may be related to a variety of non-ischemic etiologies and pathogeneses as well. The knowledge about these conditions may help to avoid misinterpretation of CT findings, inappropriate clinical uncertainty and unnecessary surgery in certain cases.